When targeting OS X, a FireMonkey form is a native Cocoa window, albeit with a custom-drawn and custom-managed client area. While FMX exposes some functionality of the underlying Objective-C class (NSWindow), there’s still quite a bit it doesn’t. 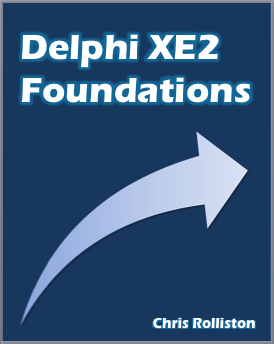 Nonetheless, NSWindow methods can be called easily enough via XE2’s Delphi to Objective-C bridge. This post provides a few examples. The setFrameAutosaveName method sets the preferences key name used and loads any previously-saved state. Because of that, it’s best to call it in an OnCreate handler. There is no need to do anything else – the state will be saved automatically when the form closes. Allow dragging a form by clicking anywhere in the client area, not just the title bar. If you enable this, be warned clicking a button will still click the button – it’s just the form will be dragged as well! This creates a PDF screenshot, in essence. Thus, if you have a memo on the form and half the text isn’t scrolled in view, then half of the text won’t be outputted to the PDF. Even still, creating a PDF screenshot is nice trick I think. Note that you will need to have had previously enabled full screen mode with the setCollectionBehavior call before toggleFullScreen will actually do anything. One question, do you know how to activate full screen mode? I see that it’s using setCollectionBehavior and constant NSWindowCollectionBehaviorFullScreenPrimary (apple’s help), but I can’t manage to work. I wrote this post before both update 4 came out and upgrading my iMac to Lion. Checking out full screen mode is on my list of things to look at next! That was quick, thanks! I’ve updated the post with your tip, and extended to show how to explicitly toggle full screen mode once it is enabled. Thanks for the post – I have used your NSWindowOfForm function to show a Webview (Webkit) window. For some reason all I get is a white background. Any chance you can have a quick look at it? Sort answer: WebView is not just a Cocoa class, but a Cocoa control, and FMX doesn’t support hosting native controls at present. An FMX form is a native form under the bonnet, but a FMX control is a completely custom affair. Thanks for the clarification Chris. My question then is where does this leave a Delphi developer looking to utilize some of these other Cocoa controls? Without Webkit for example it leaves us with no embeddable webbrowser or richedit control for OSX. Would it be possible to have theese controls/windows created in a dylib in Xcode and then called from a Delphi app? Any ideas or suggestions is much appreciated. In an analogous position to the VCL developer looking to utilise .NET controls. It isn’t creating them that’s the problem (from what you say about the ‘white background’, you appear to have actually done that), it’s integrating them. Similar to how you can’t just drop a WinForms or WPF control onto a VCL form, despite everying boiling down to Windows API calls, so you can’t just drop a Cocoa control onto a FMX form, even though both share commonalities such as NSApplication, NSWindow, etc. thanks for the fullscreen tip! is there a possibility to get notified when user clicked on fullscreen arrows in window title bar? But i cannot get it to work in Delphi. I think of events OnEnterFullscreen OnLeaveFullscreen. Any suggestion? Do you know a way to insert buttons or other controls into the form caption (toolbar) area of a osx window like standart osx applications. Sorry, I’m not sure what you mean. Do you have an example of a pure Cocoa application that has extra buttons like that? I just want to use the toolbar area of a OSX window. In IB it is combined with the titlebar so the form caption and the toolbar buttons are in a uniform panel. One approach may be to change the height of the title bar and put the controls in this area. But the thing that I couldnt manage is to get the the NSView reference of Firemonkey controls. Ah, the Cocoa toolbar widget. I’ll have a look and roll up a demo in the next few days. Basically, you call the NSToolbar API, and it adjusts the client area accordingly, a bit like adding a standard menu bar in a Windows form. Thanks for buying the book by the way! Thanks Chris, I’m looking forward for your demo, I tried it, but wasn’t so easy. The process is a variant of the NSAlert one I go through in the book. I’ve got the buttons themselves working, however I have an issue with the built-in customisation UI that needs fixing. Avid Delphi developer but left for other development pastures. Now find myself coming back to Delphi and need a quick brush up. I have purchased your book from Amazon and looking forward to reading it. Also book marked your site. full screen mode works perfectly! !